Things went so well over at noplasticshowers after I tagged and bagged all the posts that I thought I might just do the same thing here. 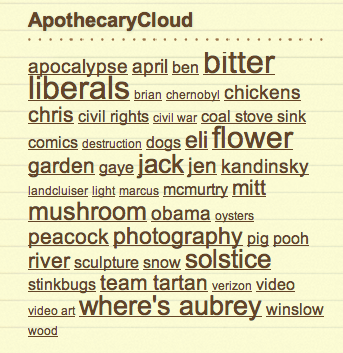 Without further ado, a bunch of categories (screen right) and a tag cloud. You can click on the live one over there, but not the fake one below! Here’s how to park behind the house at Coal Stove Sink. When you drive across the bridge over Wheat Spring Branch, go left at the fork in the driveway. Then turn off into the yard as shown. Go right past the baby sycamore tree, up the hill, and follow the gravel to the barn. Park there. How to park by the barn at Coal Stove Sink. Directions: From DC, get on the Dulles Toll Road (267 West). Then Take the Dulles Greenway Toll road (267) to Leesburg. Get on Route 7 West bypass and go past Leesburg, past Purcellville, and over the Blue Ridge mountain (20 miles). Just after you cross the Shenandoah river on the big bridge, take the first right on route 603 (castleman road). Castleman winds down by the river. When the road veers back away from the river to the left, our house is the first on the right. The Bitter Liberals have their own website now. 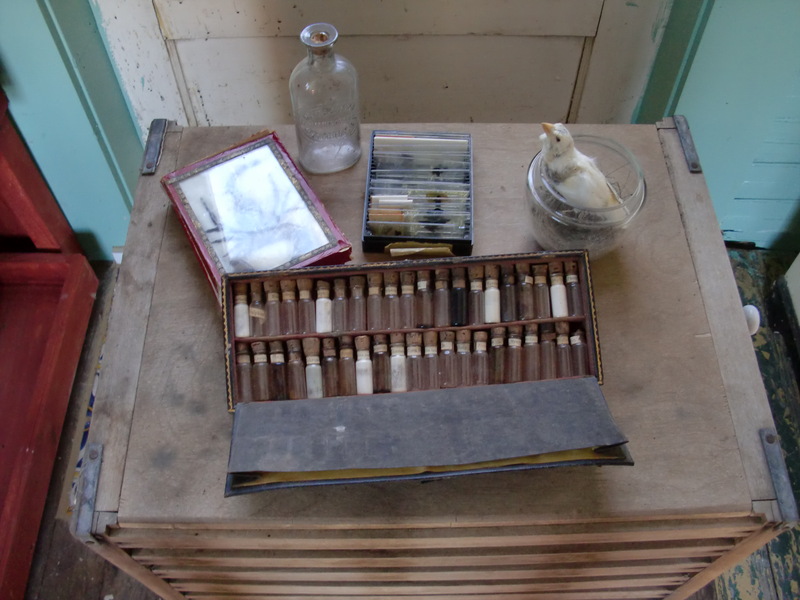 More loot for the apothecary shed collection from NH. It is important to have a scorpion. Here’s what the desk looks like mid-winter. 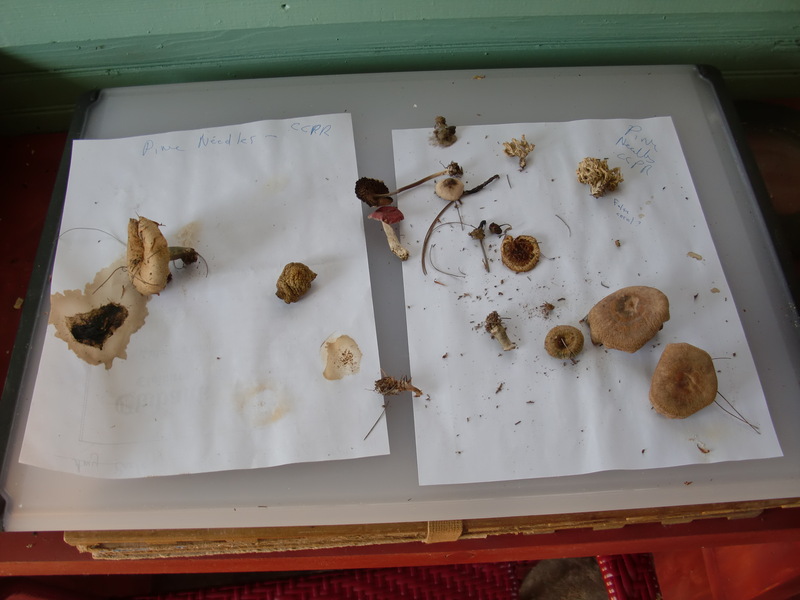 Samples collected for identification by the resident science team. A few party iterations ago (6? 7? 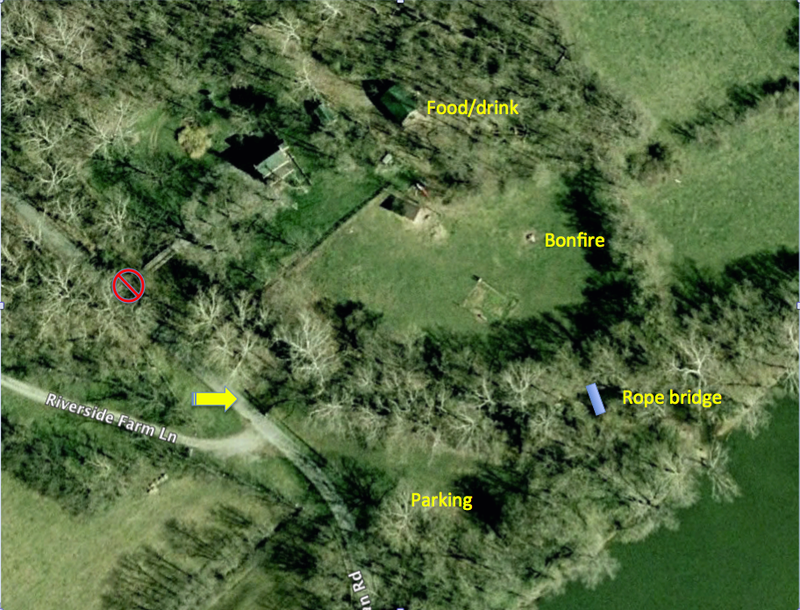 ), we started asking everyone to park in the field across the creek and walk across the rope bridge to the party. Please don’t park along the road as the authorities frown on that. 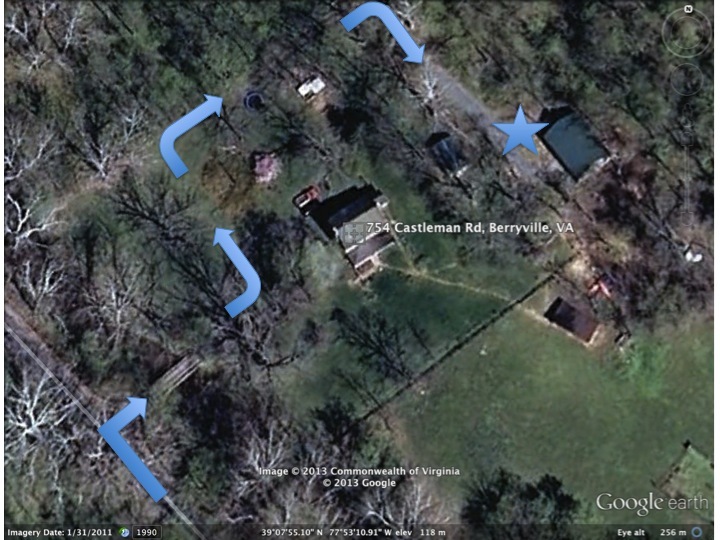 Enter the field from Castleman Road where the yellow arrow is (not the driveway where the red do not enter thing is). Enter parking field at yellow arrow gate. Park, then walk across the rope bridge. 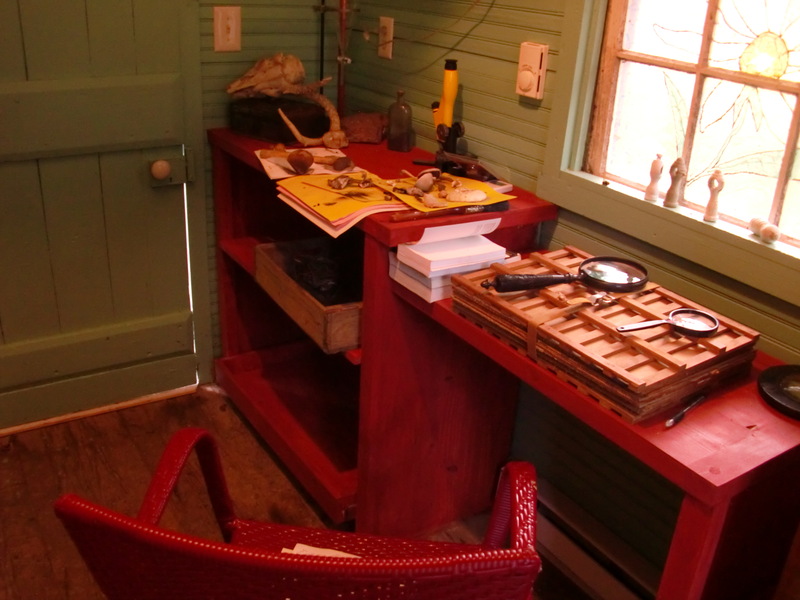 The apothecary shed is a place to do science, identify some plants, make some concoctions, and generally think about life, the universe and everything. There are a bunch of us here who may or may not contribute to this blog. Perhaps we’ll talk about guests in the adjoining Coal Stove Sink complex. Or maybe we’ll discuss mushroom identification. We’ll just have to see. The apothecary shed and its adjoining mushroom ring. 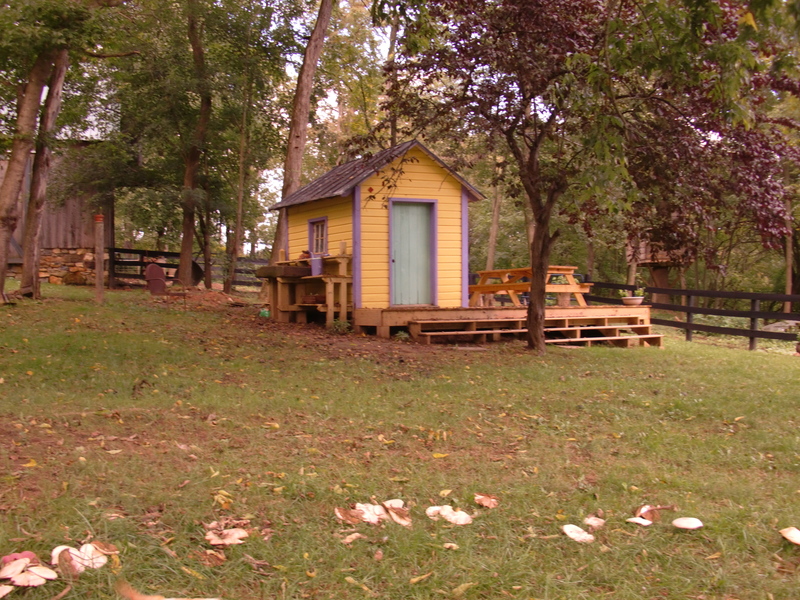 The shed is yellow with purple trim. It has a porch with a picnic table. 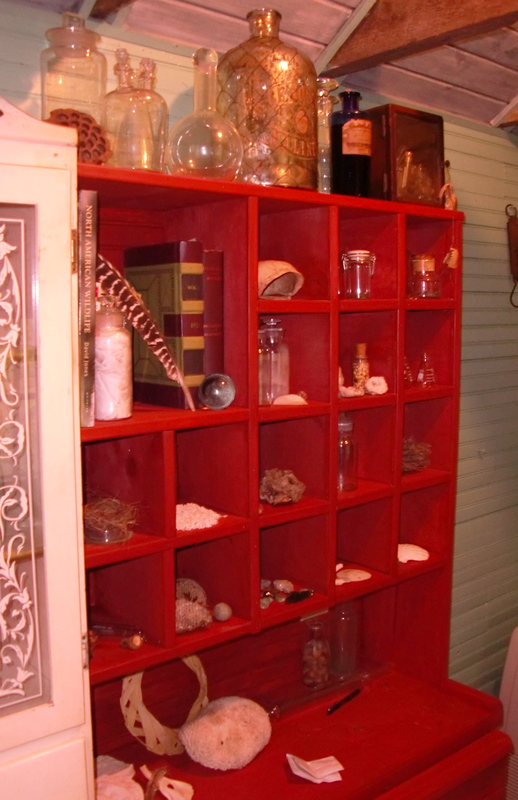 Inside, we’ve amassed a collection of nature items, specimens, notes, bones, and beakers. Some of the specimens we have piled up.